If we’re talking about the best national parks in Australia, then Karijini has to be the creme de la creme, the cream of the crop, the big daddy! When we visited there as part of our 4wd budget road trip around Australia, we were with a North American backpacker who described it as Zion National Park on crack. I’ll let you read into that what you will! But suffice to say, Karijini National Park is truly spectacular, truly huge and truly worth visiting! 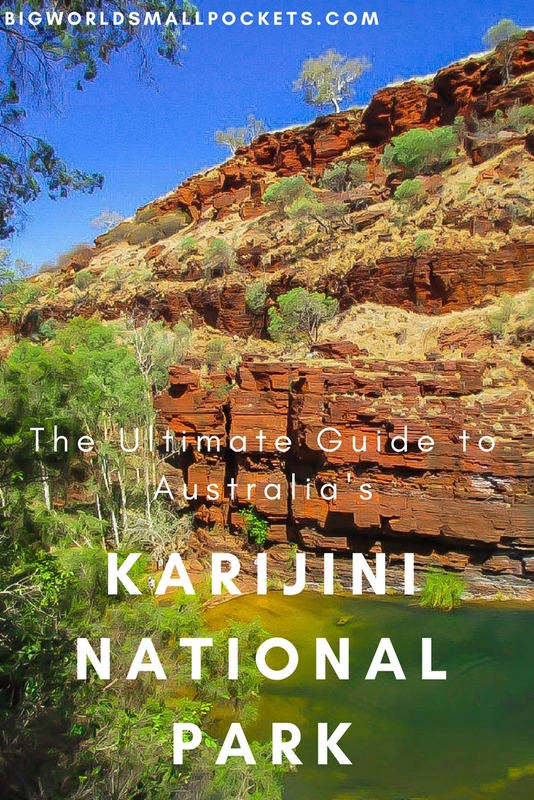 What Makes Karijini National Park Special? First up, this place is massive, in every sense of the word. Not only does it cover a huge geographical region, but the landscape itself is huge, the range is massive, the sheer expanse of it all is breathtaking! 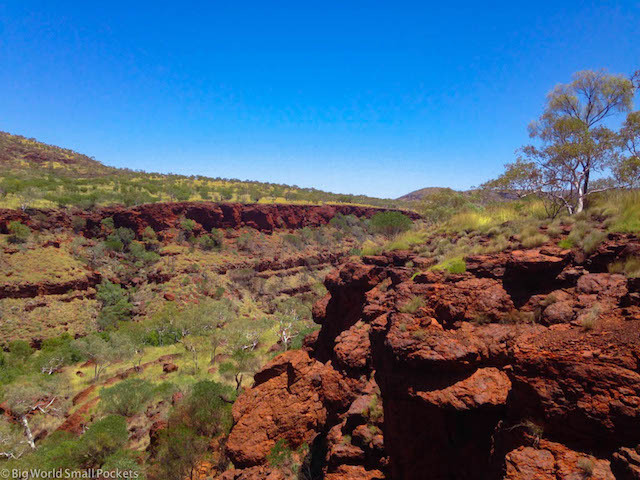 Second are the colours – that classic Outback red is heavy all around due to the iron-rich character of the earth here. Contrast this with a classic blue Pilbara sky and those ancient greens trees and you’ve got a landscape that looks as if it hasn’t changed much since the dinosaurs roamed it. 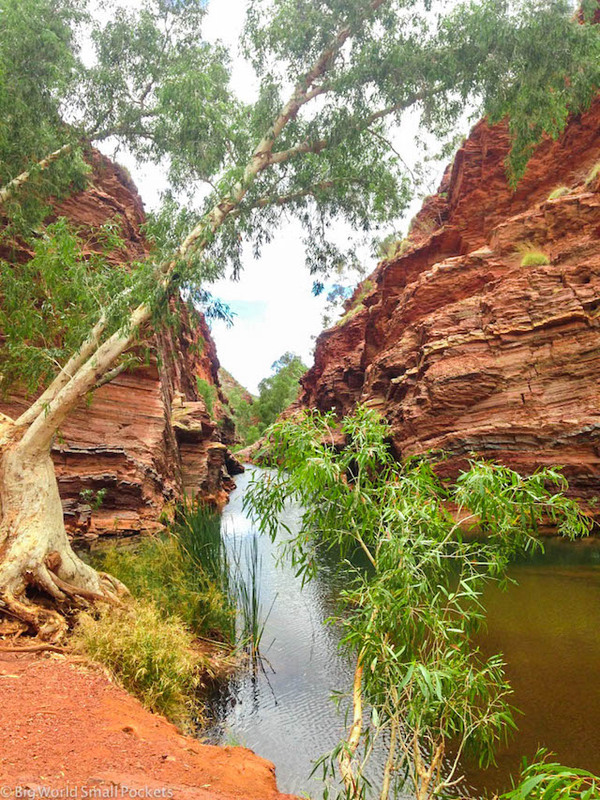 Next up are the sheer amount of activities to do here, from exploring those ancient gorges on foot, to swimming in natural water holes, to camping under the stars – Karijini National Park provides a wealth of things to see and do for next to nothing. And last, but not least the connection to country here is both tangible and magical. Revered as a special and sacred place to the indigenous population for tens of thousands of years, Karijni National Park is steeped in story and significance. Visiting here feels like is a privilege. The stepping out of our world and into another is there for all to enjoy it .. so do! Ha, now this is half the fun right! Karijini National park is located in the remote Pilbara region of Western Australia. The nearest major towns of significance are either Karratha or Port Hedland, both of which are a good few hours’ drive away. There are sealed and unsealed road options to get here, but do research in advance the route you want to take and plan accordingly – you may require a permit to travel on some roads. We made the drive from Port Hedland in a day and then headed to Karratha, via Millstream-Chichester National Park, on the way back. In between, we stopped at Tom Price a small mining town near to Karijni that had a fuel station, supermarket and visitor centre. Many road permits required can be obtained here. Outside of Tom Price there are no fuel or vehicle repair facilities in the Karijini area, so make sure you are well prepared with adequate supplies and necessary car checks in place before you come here – we actually had to rescue someone with a blown out tyre ourselves here! You also want to check the WA National Parks website before travelling to Karijini to ensure road conditions are good and the park is open. 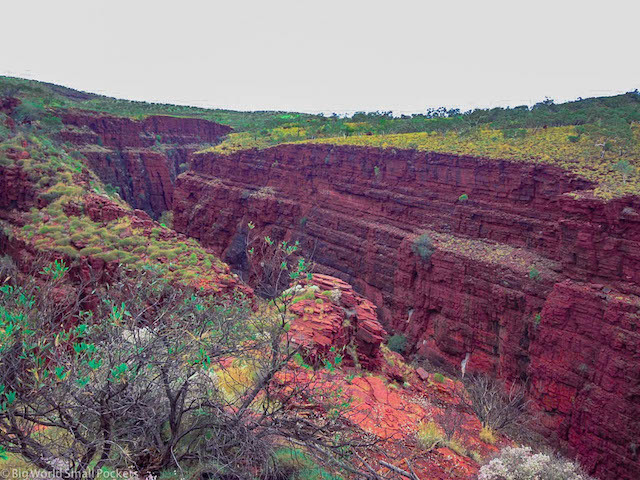 The best time to visit Karijini National Park is undoubtedly during the winter months of April – October, when the chance of heavy rain is significantly lower … as are the temperatures! Most rain falls during the summer months of November – March and access during this time to both the parks, tracks and pools can be severely restricted. Summer temperatures also regularly exceed 40 degrees, which makes doing anything in this dry, baking heat nearly impossible! During winter, the day temperatures are a little cooler, which makes hiking and exploring the park more comfortable. Nights can be chilly however, even frosty, so do bring suitable attire if you’re camping out during the colder months of July and August. We visited Karijini in early October and found it perfect. Nights were cool, not cold and daytime temperatures were great for hiking as well as taking a dip! Also the crowds were much thinner! 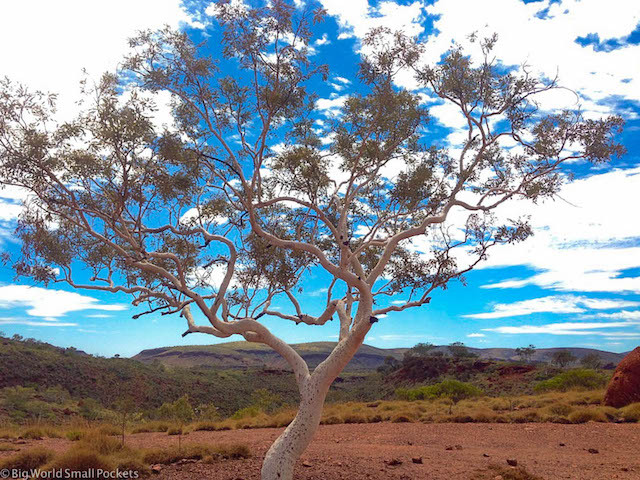 Like almost all the national parks in Western Australia, Karijini National Park has an entrance fee. Costing $12 per vehicle, this isn’t bad if there’s a few of you and is payable at the entrance to the park or the Karijni Visitor Centre. Being pretty damn remote, it’s likely that if you do visit Karijni National Park, you’ll end up staying here. Driving to the park and then seeing even a glimpse of what this spectacular place has to offer is going to take you much longer than a day! 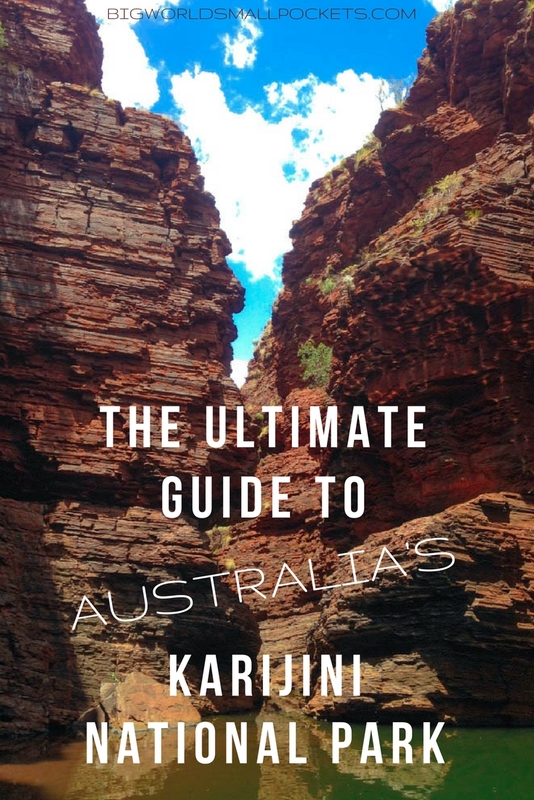 Here’s the rundown of the few places there are to stay in and around Karijini. 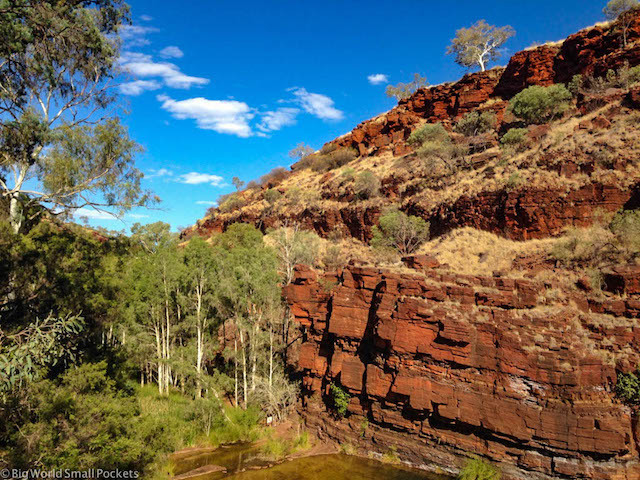 The cheapest option when it comes staying at Karijini National Park is within the national park camping itself. Even after the entrance fee, you still have pay for camping here, but given the location, it’s a bargain at only $10pppn. The National Park camping at Karijni is collected around the Dales Gorge Area of the park in its eastern section. There’s several different campsites here (essentially looped areas next to each other) with some catering for generators, caravans etc and others designated as quieter, tent zones. Camping at Dales Campground you are very near to the eastern attractions of the park including Fortescue Falls, Fern Pool, Circular Pool and the Three Ways Lookout. Campers at Dales Campground must be largely self-sufficient with no water, food or fuel on hand here. There are toilets, but no showers. 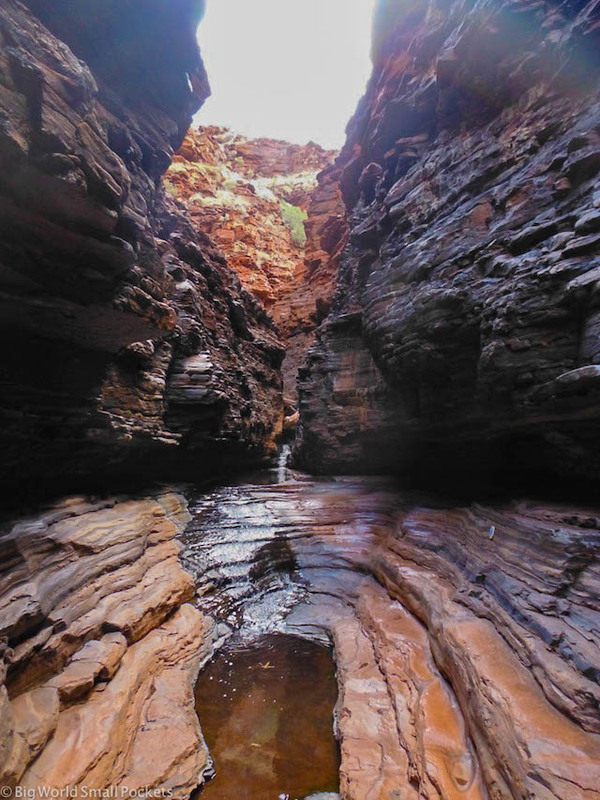 A more glamorous option can be found in the western area of Karijini National Park, otherwise known as the Weano Gorge Area. Karijni Eco Retreat is a privately-owned accommodation resort that sits within national park land. They have some lovely glamping and cabin options, for those who are less keen to rough things and also a small shop and café/restaurant, meaning you don’t have to bring all your food and water here. Showers and toilets are available too, along with a host of other amenities. Accommodation prices at the Karijni Eco Retreat are in addition to the regular park entrance fee and can be found here. The other option is stay at Tom Price and travel to the park. Here you will feel closer to civilisation and can stay in a hotel, such as the Tom Price Motel. There are also a number of free camps in and around Karijni National Park. Download the wikicamps app for more details. We stayed at one on the way in from the Port Hedland side and one on the way out near Tom Price, but paid for camping when we were actually within Karijini. This is because we worked out that the cost of driving out every night from the park to the free camp, and back again in the morning, would have cost almost as much in fuel as the $10 camping fee! 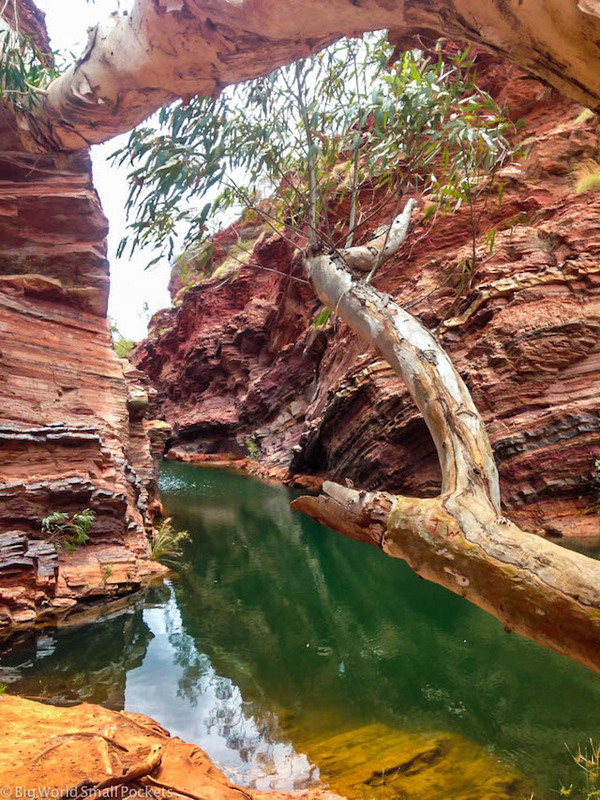 Many people advise staying between 3-4 nights when visiting Karijini National Park. This initially sounds like a very long time, but it really is advised as there is so much to do here and it takes a long time to get there! We stayed 4 nights – 2 nights in the national park camping and 2 nights in free camps just outside the park. 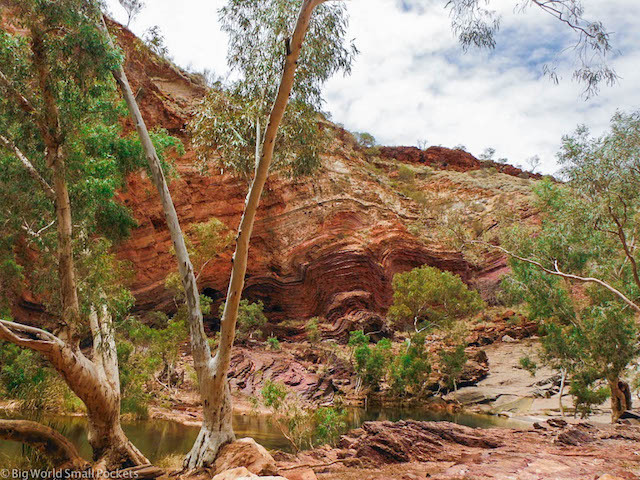 This gave us 1 day to drive there, 1 day to explore the Dales Gorge Area, 1 day to explore the Weano Gorge Area and 1 day to explore the Hammersley Gorge Area. This was well timed, as we didn’t feel rushed, but I’d hate to have cut it any shorter, especially when you’ve come all this way! 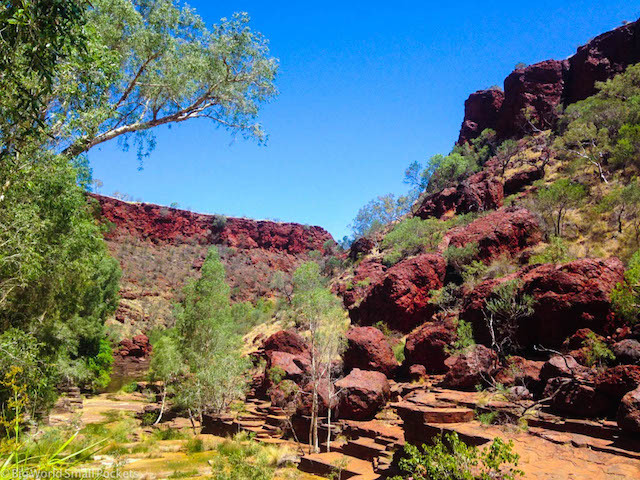 Karijini National park has several excellent walking trails. Although none of them are very long, probably given the hot climate out here and the tendency for dehydration – not to mention complex rescue operations if things do go wrong – they are extremely rewarding. It goes without saying that during any walking here you need to wear sturdy shoes and be mindful of the gorge edges which can be slippery, unstable and high. Do not hike here if there are flash flood warnings or significant rainfall! My only other advice would be to set off early and to carry lots of water. It can get very hot here in the middle of the day. From the Dales Camping Area, you can actually walk to, and then along the length of, the gorge taking in all the attractions as you go. It roughly takes 3 hours, but that’s not including time for a dip in Circular Pool, Fern Pool or Fortescue Falls. 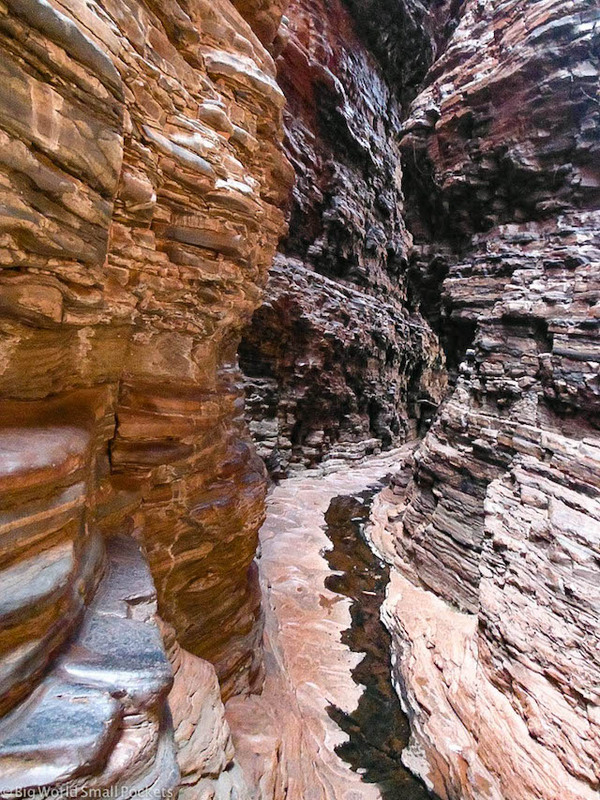 The walk is a combination of high rim walking, which gives great elevated views, and walking along the gorge floor to gain an entirely different perspective. For the Weano Gorge walks, it’s best to park in the Weano Day Area and hike from here. The 2 trails you can’t miss are the ones to Handrail Pool and Kermits Pool – these are absolutely spectacular, but do require scrambling and, at points, swimming through water.. so bring your waterproof cameras! The Spider Walk, in particular, is more an adventure sport, than a walk, but is brilliant! 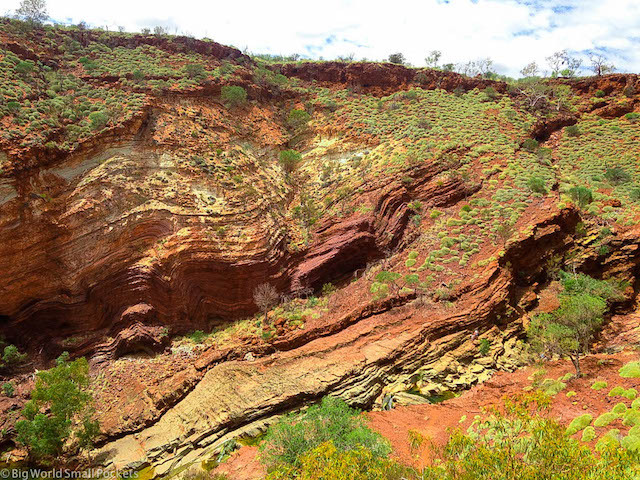 You can loop these 2 top picks together via the Oxer Lookout Trail and / or the full Weano Gorge Loop, which is definitely worth doing if you have the time. Again this will take you about 4 hours, but do allow more time for swimming, relaxing and photographing! 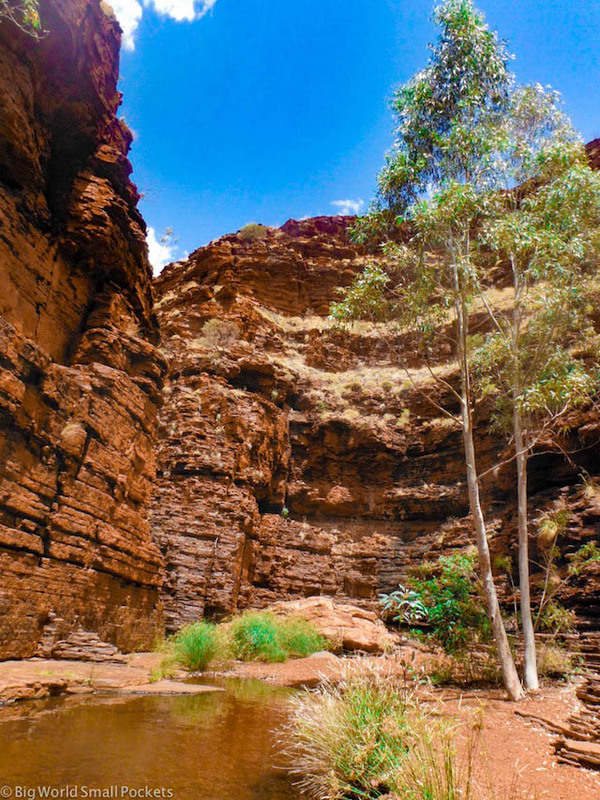 Hiking to the various pools is certainly the main attraction when visiting Karijini National Park, but alongside this, there are plenty of other things to enjoy. Check out the excellent visitor centre here, it has a very interesting exhibition about the heritage of this magical place. Wildflowers bloom here during the colder months and the spectacle they produce is quite astounding to see. Wildlife watching including kangaroos and wallaby spotting, as well as watching hundreds of bird species and reptiles is great fun. Swimming in all the wonderful rock pools and waterfalls is a great way to relax and cool down in Karijni National Park. Just be careful and don’t dive in as the water can be freezing! Photographing the landscape from some of the many lookouts is definitely one of the best things to do in Karijini National Park. Head to Hammersley Gorge, a short drive away from the other sections of the park to swim, snap and hike in this stunning spot. 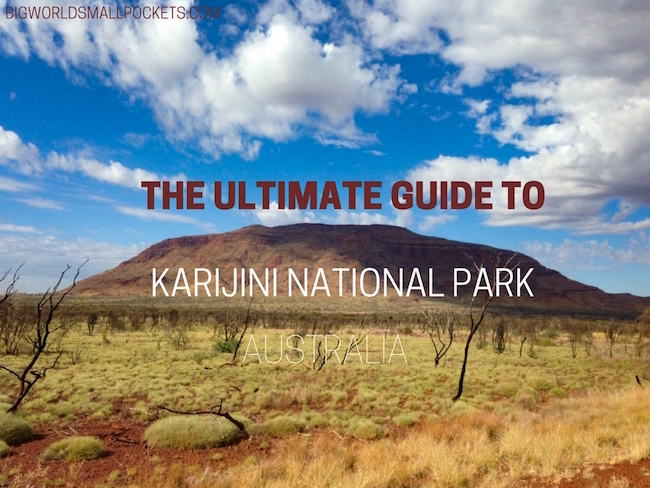 So that’s our ultimate guide for visiting Karijini National Park in Western Australia. I really can’t recommend visiting this place highly enough, so definitely consider adding it to your list if you’re ever travelling this part of the Land Down Under. It’s beyond incredible Cat, really. Just pick your time to visit carefully, because if you want to hike, heading there in winter to avoid the scorching temperatures is a must!